He has presented numerous television programmes including Extreme Dreams and as well as writing regularly for the Sunday Telegraph and The Independent, he has written four best-selling books. He is also an ambassador for WWF, Medecins Sans Frontier and Tusk. He’s a fellow of the Royal Geographical Society and the President of the Campaign for National Park’s. So, what exactly is the Mongol Derby? The idea for “the race” comes from Genghis Khan’s incredible postal system – and we’re talking many many years ago, somewhere around the turn of the 12th century. When he ‘ruled the world’ he realised the importance of being in touch, and knowing exactly what was happening and where. So he took the existing ancient and rather small network of horse messengers and supercharged it, creating a mind-bendingly efficient relay system of horse-stations that enabled his messengers to go faster than the speed of light itself. With horses stationed every 30 to 40 km it’s said he could get a message from Mongolia to Eastern Europe in just fourteen days. That would probably beat today’s postal system! This year, 2009, some bold adventurists have decided to emulate this great but forgotten postal service, resurrect the horse-stations and gather 800 horses to create the mother of all races. The Mongol Derby will tackle the challenge of semi-wild horses and surviving alone in the wild steppes of Mongolia. There’s no carefully marked course, no catering tent and no support; this is horse racing on a whole new scale. You will change steed every 40 km so the horses will be fresh. The nature of the Mongol Derby means it is the rider under stress not the horse. 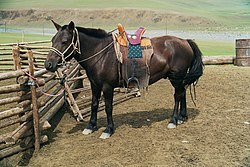 Traditional Mongolian horses are an extremely tough breed that has changed little since the Mongol Hordes swept across Asia on their backs in the early thirteenth century. They range in size from 12 to 14 hands high and roam the vast Mongolian steppe all year round. As the Mongol Derby will be run across wild terrain, not roads, the horses will be unshod as they always are. Humans are not so tough. Bleeding kidneys, broken limbs, open sores, sun stroke, moon stroke and a list of dangers longer than your arm stand between the you and victory! Now, for some of you who might be yearning to take part in this race, when does it happen? Date and location to be confirmed Afternoon tea and talk with a renowned explorer. Two-day training extravaganza with former champion jockey Richard Dunwoody. Mighty send-off from Kharkhorin, the ancient capital of the Mongol Empire. Feasting, dancing, fermented mare’s milk and Mongolian merry-making galore. Riders gallop forth into the wilderness. Catch up with your fellow racers and spin yarns of wrestles with wolves. Bathe in the glory of completing the world’s longest and toughest horse race. Riders will be lauded as pioneers and their names etched in adventuring history. It costs US$4,550 in total. However, don’t despair – you could always try for sponsorship and raise money for your favourite charity at the same time. Additional costs will be the airfare to Mongolia, a single-entry Mongolian visa, and hotel costs before and after the race. As the race approaches you will be able to track the riders live through an interactive map. The route starts in the Khentii Aimag, at Delgerhaan and ends at Kharkhorin, Chinggis Khaan’s capital, 1000km later. Before you even consider applying for this race we want to point out how dangerous the Mongol Derby is, and how dangerous the sport of horse riding is. And when we talk about horse riding, we don’t just mean getting on a horse you are familiar with at home. We mean riding a series of unfamiliar horses across wild Mongolian terrain. By taking part in this race you are greatly increasing your risk of severe physical damage. You could break limbs, suffer internal injuries, become paralysed or even die. Please do not underestimate the extreme nature of the Mongol Derby. Watch this space – I’ll keep you updated on this fantastic and extreme endurance race.